Gramophone Record of the Year-winning group The Cardinall’s Musick continues its exploration of Tallis’s sacred music. These recordings not only showcase the greatest repertoire of the English Renaissance in dazzling performances, but also illustrate the complex historical and political background of the works and their genesis. 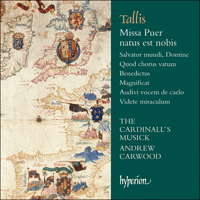 This volume presents Tallis’s extraordinary seven-voice Mass, Missa Puer natus est nobis, which dates from the Catholic reign of Mary I. In his fascinating booklet notes Andrew Carwood writes that this Mass is ‘something of a marriage between the English and Spanish Chapels, not only in its scoring but also in its sound world … the piece is sonorous and rich, a gorgeous background tapestry for a solemn celebration of the Mass, and has wonderful dramatic effects including the use of antiphony or dialogue between voices. It is a shame that Tallis wrote no more in this vein but, perhaps like Mary’s short-lived Restoration, it was a piece of the moment not to be repeated’. Other works recorded here include what is possibly Tallis’s earliest work, the four-part Latin Magnificat, and the gloriously splendid Videte miraculum, a masterpiece with a ‘rich palette of colours, enhanced by suave melodic writing with a slow-moving harmonic pulse tinged with heart-achingly gorgeous cadences’. The 1550s must have been one of the most confusing, exhilarating, perplexing and challenging of decades in which to live. Edward VI was king at the beginning, still ruled by his advisors but increasingly imposing his own will as the head of the most Protestant regime that England had seen. Prayer Books in English had been issued in 1549 and 1552 (the second more Protestant than the first) and Henry VIII’s reforms (previously held in check by the old king’s engrained Catholicism which never really left him) were moved forward with vigour and divided the country. There was war with Scotland, rural disquiet and a downturn in the economy. This was the state of the realm when Edward died on 6 July 1553 prompting the feeble attempt by his nervous advisors to place the unlucky Lady Jane Grey on the throne as a Protestant puppet. Mary, first daughter of Henry VIII, who had clearly been placed next in line by her father, was quick to react, raising forces in the East of the country and moving with ease and acclamation to the capital to take her throne. Uncompromising in her Catholic faith, she restored England to full communion with Rome (a move which was not as unpopular as it is often claimed) and became the first example of a woman successfully running England as Queen regnant. Her difficulties were not only religious (there was undoubted resistance to her policies) but also economic—a series of wet summers caused severe problems with the harvests—financial and diplomatic. In 1554 she married Philip I of Spain in a grand ceremony in Winchester Cathedral amidst considerable debate and disquiet. Her death on 17 November 1558 allowed her half-sister Elizabeth to take the throne and by May 1559 Mary’s Catholic regime was ended by Parliamentary legislation. Most composers seem to have found Mary’s arrival as Queen a stimulating and empowering period. Music was once again required in Latin and they were able to use more voices and write longer pieces. The miracle that is the Missa Puer natus est nobis is a Janus-like composition which undoubtedly dates from the time of Mary I. In common with English Mass-settings of the past Tallis does not set the Kyrie; he may well also have shortened the text of the Credo as his forebears had done but this we cannot tell as only the final few bars of this movement remain (and it is not recorded here). He takes a plainsong tune as a cantus firmus, harking back to the Masses of Robert Fayrfax, Nicholas Ludford and the early John Taverner, and sets it in long slow notes in the baritone part. In the later years of Henry VIII this idea had become rather old fashioned. Certainly Taverner in his later Masses was either using as the starting point for his Mass-settings one of his own motets (Missa Mater Christi sanctissima, Missa Sancti Wilhelmi devotio) or a secular tune (The Western Wynde Mass), or indeed no model at all (The Meane Mass). Tallis chooses a Mass Proper as his melody—Puer natus est nobis (‘Unto us a boy is born’)—rather than one from Divine Office; this is unusual and with its strict liturgical role (the Introit at third Mass on Christmas Day) it strongly suggests that the Mass was written for one of the Christmases during the time of Queen Mary. Also like his predecessors, Tallis uses a head-motif, where the same music is used as the starting point for each movement. This is where the looking back ends. Most pre-Reformation Masses were scored for five voices (SATBarB), the exception being Ludford’s ravishing Missa Videte miraculum for six voices (SSATTB). Tallis’ composition is for seven voices (AATTBarBB) without the once-common high treble part. Using such large forces would have attracted the description ‘festal’ in the pre-Reformation period but Tallis does not follow other conventions associated with this form. There are no sections for soloists and the Mass movements are not broken up by as many caesuras as one would expect. Not only is there no juxtaposition of solo and full sections but there is no official use of triple time, the piece being in duple metre throughout. Interestingly, Tallis has embraced Archbishop Cranmer’s injunction that music should not be ‘full of notes, but, as near as may be, for every syllable a note, so that it may be sung distinctly and devoutly’—a feature of the attractive miniature compositions from the reign of Edward VI. There are three other pieces by Tallis which use seven voices in this configuration—Suscipe quaeso Domine, Loquebantur variis linguis and Miserere nostri—and it has been suggested that this unusual scoring was deliberately chosen to suit performances by Philip’s Chapel Royal which seems not to have used high treble voices and was resident in England with the king between 1554 and 1555. The evidence then—a Mass based on a Christmas theme, scored for performance by the English and Spanish Chapels—points to Christmas 1554 as a possible performance time. Academics may also be correct in believing that the choice of the Puer natus cantus firmus was designed to celebrate the fact that Queen Mary was thought to be pregnant at this time. The Missa Puer natus is itself therefore something of a marriage between the English and Spanish Chapels not only in its scoring but also in its sound world which seems to owe something to the Flemish style of writing, especially in the slow-moving harmonies and the use of passing notes in the melodies (most usually upwards towards the key note) which allow the textures to shimmer. It also prominently features what became known as the ‘English cadence’, a clash of flattened and sharpened leading notes in close proximity. The piece is sonorous and rich, a gorgeous background tapestry for a solemn celebration of the Mass, and has wonderful dramatic effects including the use of antiphony or dialogue between voices (‘altissimus’ in the Gloria or the ‘Osanna’ to the Sanctus). It is a shame that Tallis wrote no more in this vein but, perhaps like Mary’s short-lived Restoration, it was a piece of the moment not to be repeated. 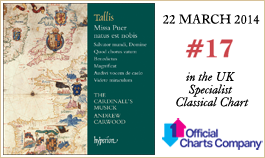 The earliest work recorded here, and perhaps indeed Tallis’ earliest surviving composition, is the four-part Latin Magnificat. This piece sounds like the work of a young composer. Here we see Tallis learning the pre-Reformation style which comes to fruition in the antiphon Salve intemerata virgo and which he was to develop further in Gaude gloriosa. It is true that one has to forgive the jejune setting of ‘et sanctum nomen eius’ (which would merit a red-pen mark from a teacher of composition), some rather ungainly imitation (‘Sicut erat in principio’) and some unusual tessituras, especially in the contratenor part. But this is to miss the fact that Tallis has correctly assimilated the style, reducing his forces at appropriate moments, varying his duple and triple metres and highlighting the word ‘Abraham’ with caesuras and adding a nice harmonic turn at the cadence (which would later become a Tallis characteristic). He has also used a faburden as the basis of his composition. A faburden is the harmonization of an existing tune, in this case a version of the Mode I plainsong (used for the verses which Tallis did not set) which can be clearly heard acting as a cantus firmus throughout and most clearly at the beginning of each section, all of which start with three descending notes. Tallis’ setting of the Benedictus, ‘Blessed be the Lord God of Israel’, is a stand-alone setting of the text instructed to be sung at the Morning Office of Mattins in Cranmer’s new Prayer Book. It is scored for lower voices and is a wonderful example of how Tallis can take a very restricted style of writing, one which is essentially quite plain, and turn out a minor masterpiece. The use of divided tenors and basses gives a warm sonority and there is a judicious amount of imitation at the beginning of some sections contrasted with greater textual clarity through homophonic writing at the start of others. Tallis allows himself a little textual repetition at the very end (the words ‘and ever shall be’, before the final ‘Amen’) but otherwise adheres to Cranmer’s advice over text-setting. William Byrd, Tallis’ pupil and friend, thought highly enough of this piece to re-use the melody of ‘which hath been since the world began’ in his Great Service some decades later. In contrast to the Magnificat, four works recorded here were quite forward-looking for their time. Hymns at Divine Office had not often been set to polyphony before the end of Henry VIII’s reign. Both John Sheppard and Tallis set a number of these Hymns and it is tempting to speculate that there was some sort of scheme here, as, between them, they cover many of the feasts of the liturgical year. The Hymns consist of a set of verses in metrical poetry where the composers provide polyphony for alternate verses, the others being sung to plainsong. Salvator mundi, Domine is taken from the Office of Compline and Quod chorus vatum is a Vespers Hymn for Candlemas. Tallis starts in triple mode for both Hymns and moves to a duple metre for the last polyphonic verse. The plainsong tunes of each Hymn are quoted in the top part, in the case of Quod chorus vatum very strictly but in Salvator mundi, Domine Tallis allows himself considerable licence as the piece develops. In both works, Tallis places strong syllables at different times within the lower voices; this provides rhythmic impetus as well as variety and means that when cadences are reached they always sound fulfilling. Audivi vocem de caelo and Videte miraculum again belong to Divine Office, the first being a Responsory for All Saints and the second one for Candlemas. A Responsory is usually designed to allow time for contemplation after a reading and has a repeating form, mixing as it were a chorus with verses. As with all plainsong it is started by a cantor (whose job it is to provide a suitable pitch for performance) and is then taken up by all the singers. Then follows a verse sung by soloists, a repeat of a portion of the first section by the full choir, and a further verse (often the first part of the ‘Gloria Patri’) followed by a final repeat from the full choir, which in shorthand looks like ‘ABACA’. John Taverner seems to have been the first composer to investigate this form with his two settings of the Easter text Dum transisset Sabbatum and his own setting of Audivi vocem. He uses two schemes. One has plainsong for the incipit and two verses and sets the portions which would have been sung by the choir to polyphony (Dum transisset). The other does the reverse, providing polyphony for the incipit and verses and leaving the choir sections to be sung to chant (Audivi vocem). Tallis’ setting of Audivi vocem de caelo uses the same form as Tavener’s setting. It is a modest piece, scored for just four voices with a divided alto part and remains serene throughout, apart from a quickening of the pulse when the warning comes that the bridegroom has arrived in the middle of the night. By contrast Videte miraculum follows Taverner’s Dum transisset scheme and, unlike Audivi vocem, is written on a grand scale for six voices with divided basses and tenors. It is one of his most gloriously splendid pieces, containing a beautiful dissonance in its opening bar which is repeated throughout the first section. This is Tallis at his finest: a rich palette of colours, enhanced by suave melodic writing with a slow-moving harmonic pulse tinged with heart-achingly gorgeous cadences. With such music it is no wonder that after his mentor’s death in 1585, William Byrd felt moved to set the words ‘Tallis is dead and music dies’. La décennie 1550 dut être l’une des plus déroutantes, des plus grisantes, des plus incompréhensibles et des plus stimulantes à vivre. Roi dans les premières années, Édouard VI, bien que toujours sous la coupe de ses conseillers, imposa de plus en plus sa propre volonté, à la tête du régime le plus protestant que l’Angleterre ait jamais connu. Des bréviaires en anglais avaient paru en 1549 et en 1552 (les seconds davantage protestants que les premiers) et les réformes engagées par Henri VIII (mais tenues en échec par le profond catholicisme qui n’avait jamais vraiment quitté le vieux roi) avançaient avec vigueur, divisant le pays. Outre la guerre avec l’Écosse, l’inquiétude régnait dans les campagnes et l’économie déclinait. Tel était l’état du royaume quand Édouard VI mourut le 6 juillet 1553, poussant ses conseillers, nerveux, à piètrement tenter d’installer sur le trône une marionnette protestante, la malheureuse Lady Jane Grey. Marie, fille aînée d’Henri VIII, lequel l’avait clairement désignée comme la suivante sur la liste des prétendants au trône, fut prompte à réagir: elle leva des forces armées dans l’est du pays et gagna sans peine la capitale, sous les acclamations. Montée sur le trône, elle demeura inflexible dans sa foi catholique et refit de l’Angleterre un pays en pleine communion avec Rome (ce qui ne fut pas aussi impopulaire qu’on l’affirme souvent), devenant la première femme à gouverner le royaume avec succès, en tant que reine en exercice. Ses difficultés furent d’ordre religieux (sa politique souleva d’indubitables résistances), mais aussi économique—une série d’étés humides compromirent gravement les récoltes—, financier et diplomatique. En 1554, au cœur de controverses et de troubles considérables, elle épousa Philippe Ier d’Espagne lors d’une cérémonie grandiose, en la cathédrale de Winchester. Sa mort, le 17 novembre 1558, permit à sa demi-sœur Élisabeth de monter sur le trône et, en mai 1559, la législation parlementaire mit un terme au régime catholique de Marie. L’arrivée au pouvoir de Marie semble avoir été, pour la plupart des compositeurs, une période stimulante, riche de possibilités. La musique dut de nouveau être en latin et les compositeurs purent utiliser davantage de voix, écrire des pièces plus longues. La miraculeuse Missa Puer natus est nobis est une composition contrastée datant, à n’en pas douter, de cette époque. Comme dans les messes anglaises du passé, Tallis ne met pas en musique le Kyrie; il se peut aussi que, toujours comme ses aînés, il ait abrégé le texte du Credo, mais nous ne pouvons en être certains, seules les dernières mesures de ce mouvement (non enregistré ici) nous étant parvenues. Rappelant les messes de Robert Fayrfax, de Nicholas Ludford et du John Taverner des débuts, il prend comme cantus firmus une mélodie grégorienne qu’il traite en lentes longues, à la partie de baryton. Ce qui était plutôt suranné vers la fin du règne d’Henri VIII. Alors que Taverner avait assurément pris pour point de départ de ses messes tardives un de ses propres motets (Missa Mater Christi sanctissima, Missa Sancti Wilhelmi devotio) ou un air profane (The Western Wynde Mass), quand il ne se passait pas carrément de modèle (The Meane Mass), Tallis, lui, choisit pour mélodie un propre tiré de la messe—Puer natus est nobis («Un enfant nous est né»)—plutôt que de l’office divin. Voilà qui est inhabituel et, vu le strict rôle liturgique de ce propre (l’Introït de la troisième messe de Noël), notre messe a fort bien pu être écrite pour un des Noëls du règne de Marie. Comme ses prédécesseurs encore, Tallis utilise un motif de tête, la même musique servant de point de départ pour chaque mouvement. Là s’arrête la référence au passé. Hormis la ravissante Missa Videte miraculum à six voix (SSATTB) de Ludford, la plupart des messes d’avant la Réforme furent écrites pour cinq voix (SATBarB). La messe de Tallis s’adresse à sept voix (AATTBarBB), sans la partie, jadis courante, de treble aigu. Avant la Réforme, une œuvre aux forces aussi imposantes eût été dite «de fête», mais Tallis ne suit pas les autres conventions associées à cette forme—il n’y a pas de sections pour soliste et les mouvements de la messe ne sont pas morcelés par autant de césures qu’attendu. Les sections solo et à chœur entier ne sont pas juxtaposées; qui plus est, la pièce est binaire de bout en bout, délaissant l’officiel mètre ternaire. Chose intéressante, Tallis avait fait sienne l’injonction de l’archevêque Cranmer, pour qui la musique ne devait pas être «pleine de notes mais s’approcher autant que possible d’une note par syllabe, pour qu’on puissa la chanter distinctement et avec dévotion»—une caractéristique des séduisantes compositions miniatures du règne d’Édouard VI. Trois pièces de Tallis (Suscipe quaeso Domine, Loquebantur variis linguis et Miserere nostri) utilisent les mêmes sept voix que la messe—une distribution inhabituelle qui aurait été délibérément retenue pour convenir à la Chapelle royale de Philippe, laquelle, visiblement dépourvue de sopranos aigus, résida en Angleterre, avec le roi, de 1554 à 1555. Les indices—une messe fondée sur un thème de Noël et devant être interprétée par les chapelles anglaise et espagnole—suggèrent donc une exécution à la Noël de 1554. Les universitaires n’ont peut-être pas tort non plus de croire que le choix du cantus firmus Puer natus entendait célébrer le fait qu’on pensait alors la reine Marie enceinte. La Missa Puer natus est donc une sorte de mariage entre les chapelles anglaise et espagnole, tant par sa distribution que par son univers sonore, apparemment un peu redevable au style flamand, comme l’attestent ses lentes harmonies et les notes de passage de ses mélodies (le plus souvent vers le haut, vers la fondamentale) pour des textures chatoyantes. Cette messe met aussi en avant ce qu’on appela la «cadence anglaise», une friction de sensibles bémolisées et diésées très proches. Retentissante et riche, elle fait une somptueuse tapisserie à une célébration solennelle de la messe, avec de merveilleux effet saisissants, notamment l’antiphonie ou le dialogue entre les voix («altissimus» dans le Gloria ou l’«Osanna» du Sanctus). Dommage que Tallis n’ait pas davantage écrit dans cette veine mais ce moment-là devait rester unique, peut-être comme l’éphémère Restauration de Marie. Le Magnificat latin à quatre parties—la plus ancienne œuvre de cet enregistrement et, peut-être, de Tallis—semble le fait d’un jeune compositeur. Tallis s’y montre en train d’apprendre le style d’avant la Réforme, concrétisé dans l’antienne Salve intemerata virgo et développé plus avant dans Gaude gloriosa. Il est vrai qu’il faut pardonner le puéril «et sanctum nomen eius» (qui mériterait d’être biffé au crayon rouge par un professeur de composition), l’imitation assez gauche à «Sicut erat in principio» et quelques tessitures inhabituelles, surtout dans la partie de contre-ténor. Mais ce serait manquer combien Tallis a correctement assimilé ce style, réduisant les effectifs aux moments opportuns, variant les mètres binaire et ternaire, soulignant le mot «Abraham» avec des césures et ajoutant un joli détour harmonique à la cadence (l’une de ses futures griffes). Il a également fondé sa composition sur un faux-bourdon, c’est-à-dire sur l’harmonisation d’une mélodie existante, en l’occurrence une version du Mode I grégorien (utilisé pour les versets que Tallis ne mit pas en musique), qui sert clairement de cantus firmus de bout en bout—notamment, de manière très évidente, au début de chaque section, partant sur trois notes descendantes. Le Benedictus («Béni soit le Seigneur Dieu d’Israël») de Tallis est une mise en musique autonome du texte devant être chanté à matines dans le nouveau livre d’office de Cranmer. Adressé à des voix inférieures, il illustre à merveille la manière dont Tallis sait élever au rang de petit chef-d’œuvre un style fort restreint, foncièrement tout simple. L’usage des ténors et des basses divisés engendre une sonorité chaleureuse et une judicieuse imitation marque le début de certaines sections, que vient contraster une plus grande clarté textuelle, grâce à l’écriture homophonique, au commencement d’autres sections. Excepté une petite redite à la toute fin (les mots «et à jamais», avant l’«Amen» conclusif), Tallis adhère aux principes prônés par Cranmer. William Byrd, disciple et ami de Tallis, estima assez cette pièce pour réutiliser la mélodie de «et cela depuis le commencement du monde» quelques décennies plus tard, dans son Great Service. Par contraste avec le Magnificat, quatre œuvres de cet enregistrement furent des plus audacieuses pour leur époque. Les hymnes de l’office divin n’avaient que rarement été mises en polyphonie avant la fin du règne d’Henri VIII. John Sheppard et Tallis en ayant mis plusieurs en musique, on est tenté de voir comme un schéma—à elles toutes, elles couvrent nombre de fêtes de l’année liturgique. Ces hymnes consistent en une série de strophes métriques: les compositeurs mettent en polyphonie une strophe sur deux, les autres étant exécutées en plain-chant. Salvator mundi, Domine est tiré de l’office de complies, tandis que Quod chorus vatum est une hymne pour les vêpres de la Chandeleur. À chaque fois, Tallis démarre en mode ternaire et passe au binaire pour la dernière strophe polyphonique. Les mélodies grégoriennes sont citées à la partie supérieure, très strictement dans Quod chorus vatum, mais pas dans Salvator mundi, Domine, où Tallis s’autorise une considérable licence. Dans les deux cas, il place des syllabes fortes à différents moments, aux voix inférieures, ce qui suscite un certain élan rythmique, une certaine variété, et implique que lorsque les cadences sont atteintes, elles semblent toujours des plus satisfaisantes. Les répons Audivi vocem de caelo et Videte miraculum, également tirés de l’office divin, sont destinés respectivement à la Toussaint et à la Chandeleur. Un répons est généralement conçu pour laisser le temps à la méditation après une lecture et présente une forme répétitive, mêlant pour ainsi dire chœur et solistes. Comme tout plain-chant, il est entonné par un chantre (chargé de fournir une hauteur de son appropriée à l’exécution), avant d’être repris par tous les chanteurs. S’ensuivent un verset chanté par des solistes, la redite d’une portion de la première section par le chœur entier, un verset supplémentaire (souvent la première partie du «Gloria Patri») et une dernière reprise à chœur entier. Ce qui, abrégé, s’apparente à une forme «ABACA», que John Sheppard semble avoir été le premier à explorer avec ses deux mises en musique du texte pascal Dum transisset Sabbatum et son propre Audivi vocem. Deux schémas sont décelables: le premier traite l’incipit et deux versets en plain-chant et met en polyphonie les portions chantées par le chœur (Dum transisset) quand le second, à l’inverse, met en polyphonie l’incipit et les versets pour laisser les sections du chœur en plain-chant (Audivi vocem). Die 50er Jahre des 16. Jahrhunderts müssen in England eines der verwirrendsten, anregendsten, erstaunlichsten und herausforderndsten Jahrzehnte überhaupt gewesen sein. Zunächst war Eduard VI. auf dem Thron, der zwar noch von seinen Beratern beherrscht wurde, jedoch zunehmend seinen eigenen Willen durchsetzte; er war das Oberhaupt des am ausgeprägtesten protestantischen Regimes, das England bis dahin erfahren hatte. 1549 und 1552 waren Gebetbücher in englischer Sprache erschienen (wobei das zweite protestantischer gehalten war als das erste) und die Reformen Heinrichs VIII. (die sich zuvor durch den eingefleischten Katholizismus des alten Königs, den er nie wirklich ablegte, in Grenzen gehalten hatten) wurden nun mit Nachdruck vorangetrieben und teilten das Land. Man befand sich im Krieg mit Schottland, es gab Unruhen auf dem Land sowie einen Wirtschaftsabschwung. In diesem Zustand befand sich das Königreich, als Eduard am 6. Juli 1553 starb und seine nervösen Berater den nicht sehr nachdrücklichen Versuch unternahmen, die unglückliche Lady Jane Grey als protestantische Marionette auf den Thron zu setzen. Maria, die erste Tochter Heinrichs VIII., die offensichtlich von ihrem Vater auf die erste Stelle in der Thronfolge platziert worden war, reagierte schnell, mobilisierte Truppen in Ostengland, zog mit Leichtigkeit und unter Beifall in die Hauptstadt und bestieg den Thron. Sie war kompromisslos in ihrem katholischen Glauben, stellte die volle Kommunion zwischen England und Rom wieder her (was nicht so unbeliebt war, wie oft dargestellt wird) und regierte England erfolgreich als erste Frau. Schwierigkeiten hatte sie jedoch nicht nur auf dem Gebiet der Religion (es gab zweifellos Widerstand gegen ihre Strategien), sondern auch in der Wirtschaft—mehrere aufeinanderfolgende verregnete Sommer hatten die Ernten stark reduziert—im Finanzwesen und in der Diplomatie. 1554 heiratete sie Philipp I. von Spanien: unter beträchtlichen Kontroversen und Unruhen fand eine prachtvolle Zeremonie in der Kathedrale zu Winchester statt. Nach ihrem Tod am 17. November 1558 bestieg ihre Halbschwester Elisabeth den Thron und im Mai 1559 wurde Marias katholisches Regime durch parlamentarische Gesetzgebung endgültig aufgelöst. Die Ankunft Marias wurde von den meisten Komponisten offenbar als stimulierend und inspirierend empfunden. Musik musste nun wieder in lateinischer Sprache geschrieben werden und es konnten mehr Stimmen verwendet und längere Stücke komponiert werden. Die wundersame Missa Puer natus est nobis ist eine janusköpfige Komposition, die zweifellos aus der Zeit Marias I. stammt. Ebenso wie in seinen früheren englischsprachigen Messvertonungen vertont Tallis auch hier das Kyrie nicht; zudem ist es möglich, dass er den Text des Credos ebenfalls verkürzte, so wie es seine Vorgänger gehalten hatten. Da jedoch nur die letzten Takte dieses Satzes (der hier nicht eingespielt ist) überliefert sind, lässt sich dies nicht überprüfen. Er verwendet einen Cantus planus als Cantus firmus, der in langen, langsamen Noten in der Bariton-Stimme erklingt, und bezieht sich damit auf die Messen von Robert Fayrfax, Nicholas Ludford und dem jungen John Taverner. Gegen Ende der Ära Heinrichs VIII. war dieses Konzept aus der Mode gekommen. Taverner zumindest legte seinen späteren Messen jeweils eine seiner eigenen Motetten (Missa Mater Christi sanctissima, Missa Sancti Wilhelmi devotio) oder eine weltliche Melodie (The Western Wynde Mass) oder auch gar kein anderes Werk (The Meane Mass) zugrunde. Tallis entschied sich hier für ein Messproprium als Melodie—Puer natus est nobis („Uns ist ein Kind geboren“)—anstelle einer Melodie aus dem Offizium; es ist dies ungewöhnlich und die strikte liturgische Funktion (der Introitus der dritten Messe am 1. Weihnachtsfeiertag) ist ein starker Hinweis darauf, dass die Messe für eines der Weihnachtsfeste zur Zeit der Herrschaft Marias entstand. Wiederum in Anlehnung an die Techniken seiner Vorgänger verwendet Tallis hier ein Kopfmotiv, wobei dieselbe Musik zu Beginn aller Sätze verwendet wird. Hier enden jedoch die Rückbezüge. Die meisten vorreformatorischen Messen waren fünfstimmig (SATBarB) angelegt, mit der Ausnahme von Ludfords hinreißender Missa Videte miraculum zu sechs Stimmen (SSATTB). Tallis’ Werk ist für sieben Stimmen (AATTBarBB) und ohne die einst geläufige hohe Treble-Stimme gesetzt. Bei einer derart großen Anlage hätte man in der vorreformatorischen Zeit von einem „festlichen“ Werk gesprochen, doch hält sich Tallis nicht an die anderen Konventionen, die mit dieser Form einhergehen. Es gibt keine solistischen Abschnitte und die einzelnen Sätze der Messe sind nicht von so vielen Zäsuren durchbrochen, wie man erwarten könnte. Nicht nur findet hier keine Gegenüberstellung von solistischen und vollbesetzten Passagen statt, es wird auch offiziell kein Dreierrhythmus eingesetzt, da das Werk durchgängig im Zweiertakt steht. Interessanterweise hielt Tallis sich hier an Erzbischof Cranmers Verfügung, dass die Musik nicht „voller Töne“ sein solle, „sondern, so weit als möglich, für jede Silbe einen Ton“ haben solle, „so dass die Musik deutlich und fromm gesungen werden“ könne—ein Charakteristikum der reizvollen Miniatur-Kompositionen aus der Herrschaft Eduards VI..
Es existieren noch drei weitere siebenstimmige Stücke von Tallis mit derselben Anordnung—Suscipe quaeso Domine, Loquebantur variis linguis und Miserere nostri—und es ist darauf hingewiesen worden, dass diese ungewöhnliche Besetzung möglicherweise bewusst für Philipps Chapel Royal gewählt wurde, die offenbar keine hohen Treble-Stimmen hatte und zusammen mit dem König von 1554 bis 1555 in England ansässig war. Diese Indizien—eine Messe, der ein weihnachtliches Thema zugrunde liegt und die zur Ausführung von der englischen und spanischen Kapelle angelegt ist—weisen auf Weihnachten 1554 als möglichen Aufführungszeitpunkt hin. Die Forscher mögen auch darin recht haben, dass mit der Wahl des Puer natus-Cantus firmus die Annahme gefeiert werden sollte, dass Königin Maria zu der Zeit schwanger war. Die Missa Puer natus ist daher selbst eine Art Vermählung der englischen und spanischen Kapelle—nicht nur, was die Besetzung, sondern auch was die Klangwelt angeht, die auf den flämischen Kompositionsstil Bezug zu nehmen scheint, insbesondere in den sich langsam bewegenden Harmonien und in dem Einsatz von Durchgangstönen in den Melodien (die meist nach oben zum Grundton hin gerichtet sind), wodurch das Gefüge schillert. Zudem kommt ein Stilmittel, das später als „englische Kadenz“ bezeichnet wurde—ein Aufeinanderstoßen von erniedrigten und erhöhten Leittönen in unmittelbarer Nähe—, vermehrt zum Ausdruck. Das Werk ist volltönend und reichhaltig, ein prachtvoller Klangteppich für den Hintergrund der Messfeier, und hat wunderschöne dramatische Effekte, wie etwa den Einsatz von Antiphonie oder auch Dialogen zwischen den Stimmen („altissimus“ im Gloria oder das „Osanna“ zum Sanctus). Es ist bedauerlich, dass Tallis nicht mehr Werke in dieser Art schrieb—vielleicht war es, ebenso wie die kurzlebige Restaurationszeit Marias, ein Werk des Augenblicks, der sich nicht wiederholen sollte. Das älteste hier vorliegende Werk, bei dem es sich möglicherweise sogar um die älteste überlieferte Komposition Tallis’ handelt, ist das vierstimmige Magnificat in lateinischer Sprache. Das Stück weist Merkmale eines jungen Komponisten auf. Hier kann man mitverfolgen, wie Tallis sich den vorreformatorischen Stil aneignet, der in der Antiphon Salve intemerata virgo ausgereift zutage tritt und der in Gaude gloriosa noch weiter entwickelt werden sollte. Es ist wahr, dass man über die etwas unzulängliche Vertonung der Worte „et sanctum nomen eius“ (die von einem Kompositionslehrer zurecht rot angestrichen würde), über unbeholfene Imitation („Sicut erat in principio“) und über ungewöhnliche Tonumfänge, insbesondere in der Contratenor-Stimme, hinwegsehen muss. Doch gleichzeitig sollte nicht übersehen werden, dass Tallis sich den Stil korrekt angeeignet hatte, seine Besetzung an entsprechenden Stellen reduziert und den Zweiertakt mit einem Dreiertakt abgewechselt, das Wort „Abraham“ mit Zäsuren hervorgehoben und eine schöne harmonische Wendung bei der Kadenz verwendet hatte (was später eines seiner Markenzeichen werden sollte). Zudem hatte er seiner Komposition den Faburden zugrunde gelegt. Ein Faburden ist die Harmonisierung einer bereits existierenden Melodie; in diesem Falle handelt es sich um eine Version des Cantus planus Modus I (der für die Verse eingesetzt ist, die Tallis nicht vertonte), der durchweg deutlich als Cantus firmus hörbar ist, insbesondere jeweils zu Beginn der einzelnen Abschnitte, die alle mit drei absteigenden Tönen anfangen. Tallis’ Vertonung des Benedictus, „Blessed be the Lord God of Israel“ [„Gepriesen sei der Herr, der Gott Israels“], ist eine einzelstehende Vertonung des Texts der Morgenandacht, „Mattins“, gemäß des neuen Gebetbuchs Erzbischof Cranmers. Das Werk ist für tiefe Stimmen gesetzt und demonstriert sehr schön, dass Tallis einen äußerst schlichten und eingeschränkten Kompositionsstil verwenden und damit ein kleines Meisterwerk hervorbringen konnte. Der Einsatz geteilter Tenöre und Bässe sorgt für eine warme Klangfarbe und zu Beginn einiger Abschnitte erklingen wohldosierte Imitationspassagen, denen die Homophonie mit besserer Textverständlichkeit zu Beginn anderer Abschnitte gegenübergestellt ist. Ganz am Ende erlaubt sich Tallis eine kleine textliche Wiederholung (die Worte „and ever shall be“ [„und allezeit“] vor dem letzten „Amen“), sonst jedoch hält er sich an Cranmers Empfehlungen bezüglich der Textvertonung. William Byrd, Tallis’ Schüler und Freund, schätzte dieses Werk so hoch, dass er die Melodie, die bei den Worten „which hath been since the world began“ [„so hat er verheißen von alters her“] erklingt, mehrere Jahrzehnte später in seinem Great Service wiederverwendete. Im Gegensatz zu dem Magnificat sind vier andere hier eingespielte Werke für ihre Zeit ausgesprochen vorausschauend. Hymnussätze für das Offizium waren vor dem Ende der Herrschaft Heinrichs VIII. nicht oft polyphon vertont worden. Sowohl John Sheppard als auch Tallis vertonten eine ganze Reihe dieser Hymnussätze und man ist versucht, zu spekulieren, ob sie sich wohl miteinander abgesprochen hatten, da sie zusammen viele Festtage des Kirchenjahres abdecken. Die Hymnussätze bestehen aus mehreren metrisch gedichteten Strophen, wobei die Komponisten jede zweite polyphon vertonen und die übrigen Strophen zum Cantus planus gesungen werden. Salvator mundi, Domine stammt aus dem Offizium der Komplet und Quod chorus vatum ist ein Vesperhymnus für Mariä Lichtmess. Tallis beginnt beide Hymnen im Dreierrhythmus und wechselt in der letzten polyphonen Strophe in einen Zweiertakt. Die Cantus-planus-Melodien der Hymnen erklingen jeweils in der Oberstimme; in Quod chorus vatum wird dies sehr strikt gehandhabt, während Tallis sich in Salvator mundi, Domine im Laufe des Stücks beträchtliche Freiheiten erlaubt. In beiden Werken platziert Tallis starke Silben an verschiedene Stellen innerhalb der tiefen Stimmen und sorgt damit für rhythmischen Antrieb und Abwechslung, so dass die Kadenzen stets äußerst befriedigend klingen. Audivi vocem de caelo und Videte miraculum stammen wiederum aus dem Offizium—das erste Stück ist ein Responsorium für Allerheiligen und das zweite für Mariä Lichtmess. Ein Responsorium ist zumeist so angelegt, dass es nach einer Lesung Zeit zur inneren Einkehr erlaubt; es hat eine sich wiederholende Anlage, in der Chor und solistische Strophen miteinander kombiniert werden. Wie gewöhnlich beim Cantus planus, beginnt das Stück mit einem Vorsänger (dessen Aufgabe es ist, eine passende Tonhöhe für die Vorführung anzugeben) und wird dann von dem gesamten Gesangsensemble fortgeführt. Darauf folgt eine Strophe, die von Solisten gesungen wird, eine Wiederholung eines Teils des ersten Abschnitts durch den gesamten Chor, eine weitere solistische Strophe (oft der erste Teil des „Gloria Patri“), worauf eine letzte Wiederholung des gesamten Chors erklingt, die kurzschriftlich ausgedrückt eine „ABACA“-Form hat. John Taverner scheint diese Form mit seinen beiden Vertonungen des Oster-Textes Dum transisset Sabbatum sowie mit seiner eigenen Vertonung von Audivi vocem als Erster erkundet zu haben. Er verwendet zwei Formen. Bei der einen erklingt Cantus planus zum Incipit, worauf zwei Strophen folgen; die Chorpassagen sind polyphon vertont (Dum transisset). Bei der anderen hält er es umgekehrt, vertont das Incipit und die Strophen polyphon und setzt Cantus planus für die Chorpassagen (Audivi vocem). Tallis’ Vertonung des Audivi vocem de caelo ist gemäß demselben Schema des entsprechenden Werks von Taverner komponiert. Es ist ein bescheidenes Stück, das lediglich für vier Stimmen mit geteilter Altstimme gesetzt ist. Die Atmosphäre bleibt durchweg gelassen, mit der Ausnahme einer Pulsbeschleunigung, wenn die Warnung kommt, dass der Bräutigam mitten in der Nacht angekommen sei. Videte miraculum hingegen ist nach der Anlage, die Taverner in Dum transisset verwendet hatte, komponiert und hat, anders als Audivi vocem, eine großartige, sechsstimmige Anlage mit geteilten Bässen und Tenören. Es ist dies ein besonders prächtiges Stück und enthält im Anfangstakt eine wunderschöne Dissonanz, die im Laufe des ersten Abschnitts mehrfach wiederholt wird. Hier zeigt sich Tallis von seiner besten Seite: es präsentieren sich eine reiche Klangfarbenpalette, einnehmende Melodien und ein sich langsam bewegender harmonischer Puls, der mit schmerzlich schönen Kadenzen durchwirkt ist. Angesichts derartiger Musik ist es kein Wunder, dass William Byrd sich nach dem Tod seines Mentors im Jahre 1585 dazu bewogen fühlte, die Worte „Tallis ist tot und die Musik stirbt“ zu vertonen.